My first Quiet Book ! Here's a project I completed recently and one that I'd been itching to post online. (I already did it on my fb page but thought it's worth putting it up here). It's a busy / quiet book for my little girls. 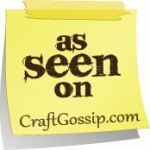 There are so many ideas online and each project is unique and beautiful in its own way. My inspiration was derived from a multitude of blogs/websites on Pinterest. Anyway, I don't think I need to do much talking here; the pictures are quite self-explanatory. I'm really really happy with the way it turned outI'm also very very grateful to all those who gave me positive feedback; it made the whole experience worth so much more. Oooh ...and my girls love it too! ;) So without further ado, here's the finished project. This turned out to be an expensive project because I only had very limited supplies at hand, not to mention very very time-consuming. But I think the end result for me was well worth it; hopefully it will be a keepsake for my girls as they grow. Also, because of my kids' age difference (2 and 4), I tried to include a mixture of activities for both younger and older toddlers. My 4 year-old loves practicing how to tell the time and my younger one loves pulling the clothes and shoes off the doll's page :P So it has worked out well methinks. Do tell me what you think of this project and post your comments below. I would love to hear from you! Tutorial: 5-minute easiest thread organizer EVER! Here's a tutorial that I've been itching to share on MCW for a while now. It all started when I started looking around for a cheap way to store my thread spools efficiently. Now I am no seamstress but I do have a small collection of spools of various colours that come in handy from time to time. Previously I had been storing these in an old shoe box. I tried a number of different homemade thread organisers including the one where you stick bamboo skewers in a foam board and then hot-glue them in and then frame it. But most of these took too much time and the eventual result was not as efficient as I would've liked. I needed something that is compact yet roomy that can be stashed away and then taken out when needed, and that can show me my thread spools at a glance. Enter the Box-Lid Thread Organizer! 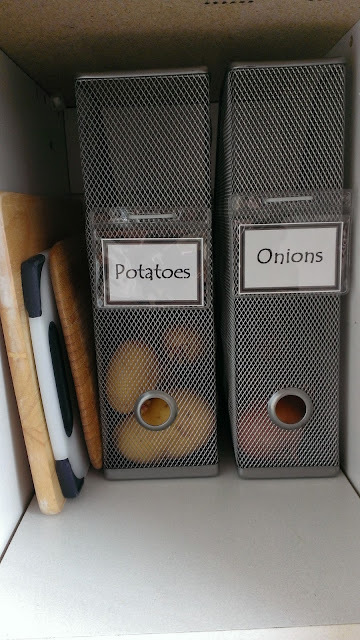 This is a super quick organizer to make using only 4 things you've probably all got lying around your home. And if you are as clumsy as I am, it should take you all of 5 -- yes, FIVE -- minutes! So without further ado, let's grab those supplies. That's it. Now I did take plenty of photographs for this to reduce verbosity. You will find that this makes it pretty self-explanatory. 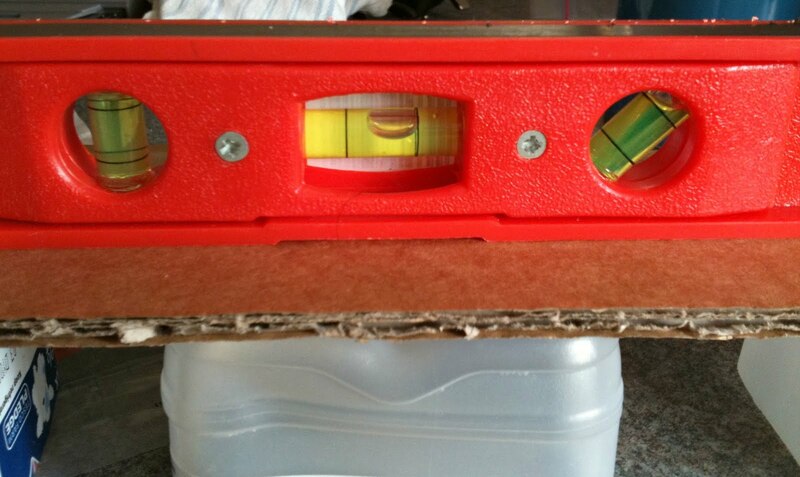 Put the lid flat on a table, hollow side up, and punch a series of holes close together along the two lengths of the lid. 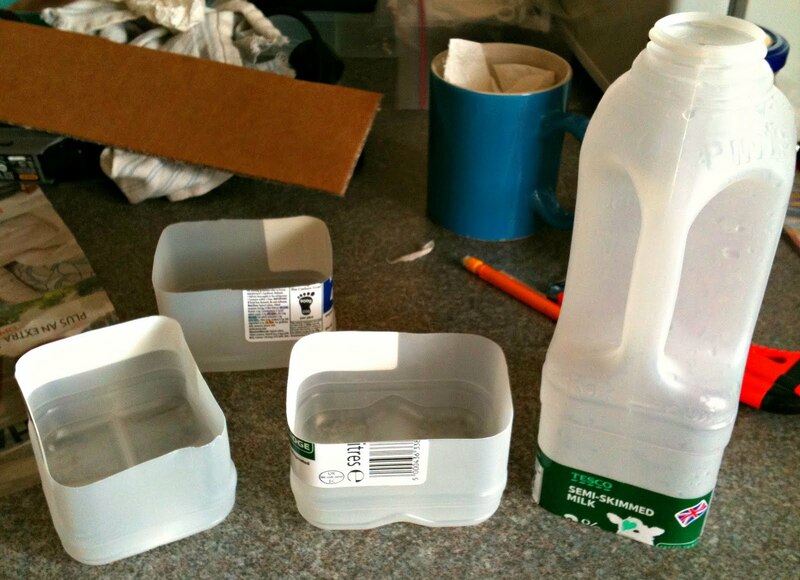 Tip: it helps to hold the hole punch on its side and push it down onto the cardboard edge. Then lift the lid and jiggle the punch deeper down the edge. Otherwise you might end up with a shallow hole like I did initially. Once both the long sides have been punched through, start threading your twine in a zig-zag manner as shown in the pictures. Knot the twine at the top. Now back-track along your zig-zag, pulling and making it taut as you go down to the original threading hole. Once here, keep the twine taut and snip off from the spool, leaving about 6 inches in excess. Now knot this end to the box too, making sure your zig-zags are still fairly taut. That's it! Your threat organizer is ready! Now fill it up with your spools and see how they nestle in neatly side by side. Once full, stand back and admire your handy work. Here I am going all ninja on it and flipping it upside down. No spools lost, woohoo!! ...And here it is, sitting cosy next to my sewing basket. ...And here's another shot along the narrow side. Enjoy! And let me know how your projects turned out. I'm a big fan of fun sensory stimulation for toddlers. And what better excuse to whip up some play-dough than a miserable morning downpour? 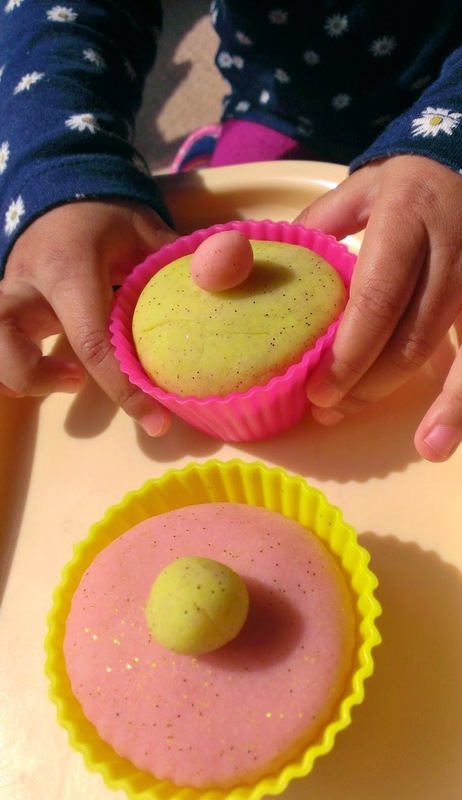 I've been regularly making play dough at home for a few months now and have safely pinpointed my no-fail go-to recipe. I have made it even more fun by adding a sensory aspect to it aka essential oils. The end result - a lovely squishy soft dough that shimmers and sparkles as it is rolled and poked and moulded into different shapes. Not only that, it also smells beautiful and keeps for MONTHS! Want to give it a go? Go grab your ingredients! Optional- 3 drops of essential oil e.g. lavender, orange, lemon etc. Set your hob to lowest heat/flame and put the pan on. Stir every few seconds until dough makes a clumpy lump or gets difficult to stir. Remove immediately from the heat. Take out into a large bowl/plate. At this stage, you can either divide it into smaller sections or work with one large lump. Set the timer for 5 minutes and start kneading. 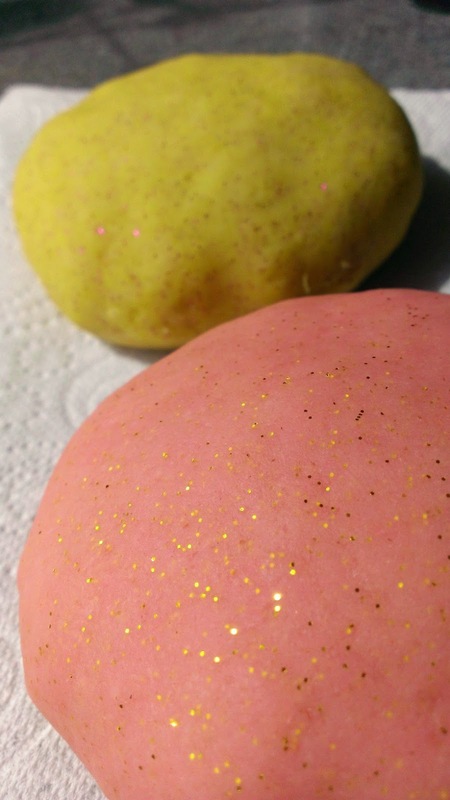 Add food colour and glitter while doing so. The end result should be a very soft, smooth, pliable dough that springs back when poked with a finger. Alternatively, you can do step 4 using a food processor/mixer as well. 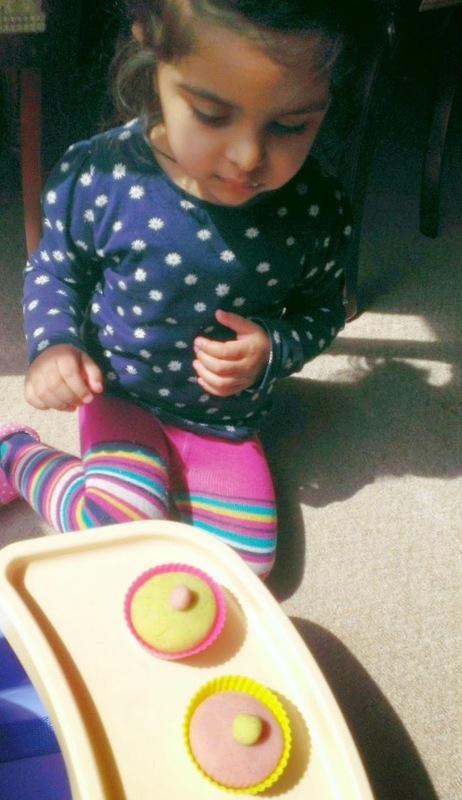 To get a long undisturbed quiet tea break maximum play time and sensory fun, gradually introduce tools and toys such as cookie cutters, rolling pins, silicone cupcake moulds, large buttons, toy cutlery etc. Put the kettle on, sit back and watch an episode of your favourite sitcom while your toddler gets some quiet sensory creative fun. Did you try this recipe? How did it go? Post below and happy crafting! It has been many months and a brand new baby later that I am returning to my blog. The past few months have been a whirlwind mommying a toddler, a bump, a C-section and countless diaper changes. Now with two kids out of my belly and finally settling into a routine, I've been able to return to MCW. That is not to say that I was being a complete craft slob. There was the odd project I'm proud of. Details later. Well although I clicked and placed it into my checkout basket, try as I might, that thrifty niggle in my pointer wouldn't let me hit "Proceed to checkout". And I'm so glad because I came up with not one but a number of dummy clips in a matter of minutes. No sewing involved and with only my craft supplies at hand. The best part for me though is this - I can even use it during DD's bedtime without fear of choking. Because I have kept the length of ribbon quite short, if she loses the dummy while sleeping, the max it does is touch her ear. No fear of the ribbon tangling around baby's precious neck. You can even make it any colour to match the outfit/pram/mood! Total time - 3 minutes. Have you made something like this or did you try out this gadget? Post and let me know. Happy crafting! P.S. 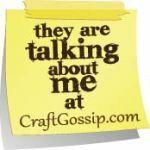 This post was featured here on Craftgossip.com! 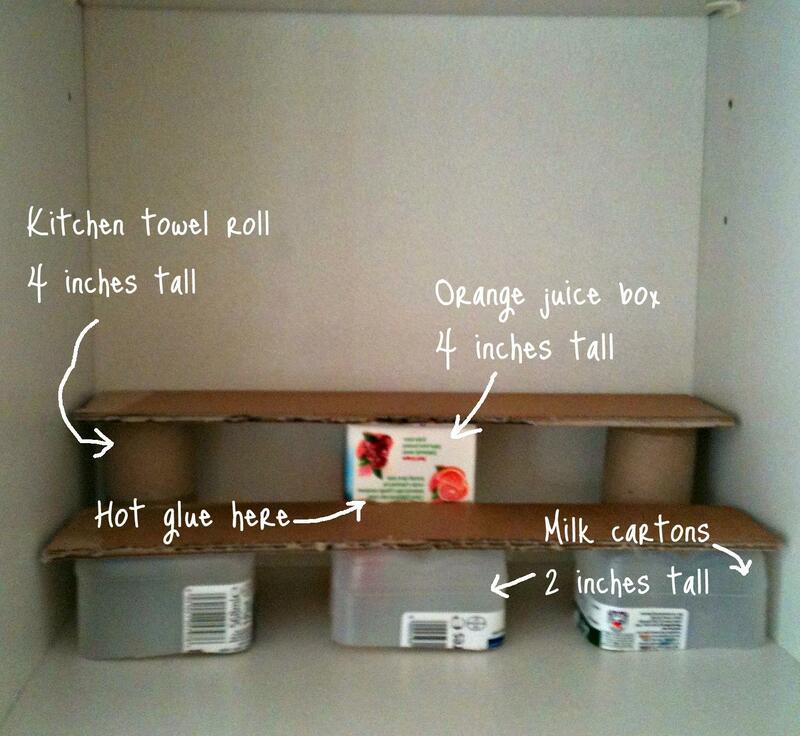 To determine the width of each cardboard strip, look to the the fattest jar/bottle that you have in your cupboard. 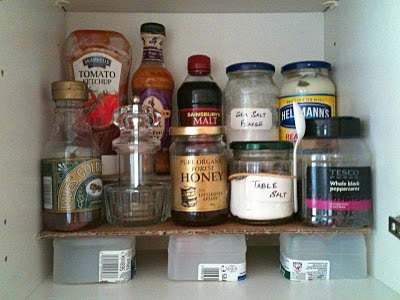 In my cupboard, for instance, the fattest jar is Hellman's mayo (see photo above). 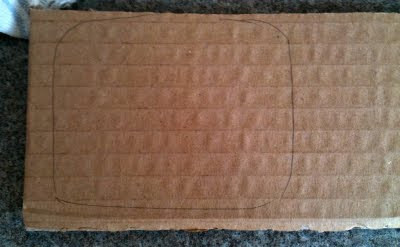 So in short, my cardboard strip is wide enough to accommodate a Hellman's mayo bottle. This will be (the number of times your fattest bottle will sit inside the cupboard) minus 1. So for my cupboard, I took the jar of Hellman's and placed it inside the cupboard; I counted that only 3 bottles of the mayo would sit front to back in a single row. So the number of cardboard strips I need is is 3 -1 = 2 cardboard strips. 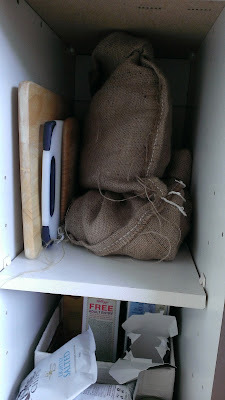 Now for the thrifty, salvage-y, crafty bit **grin**. 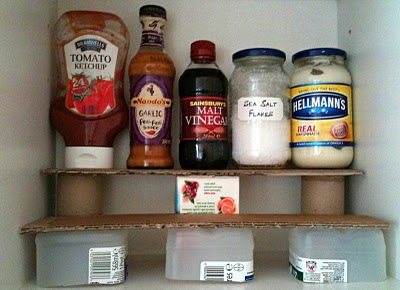 I took the tallest bottle in my cupboard and held it up to where I wanted it sitting inside the cupboard. I held a ruler next to it in my other hand and eyeballed the height of my first tier; it had to be about 4 inches tall. For the second tier, I simply opted to halve the height of the taller tier i.e. 2 inches. I hot-glued each of the bottle bottoms inside their outlines to create a wonky little tier, see? And there you have it, one tier all done! Can you see all the recycled bits and bobs I used to create the tiers for my cupboard? When assembled, put the tiers in your empty cupboard and see how they're doing. If all seems okay, pull out your hot glue gun and connect the tiers together at all the places where two tiers touch each other. 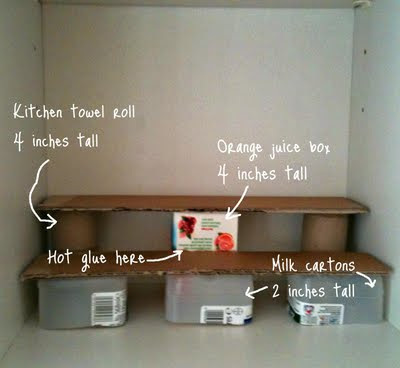 My tiers were touching each other where the orange juice box is, so I hot-glued 'em there. It all looks a bit raw and wonky ... but all of that will disappear in one-two-three! Voila! 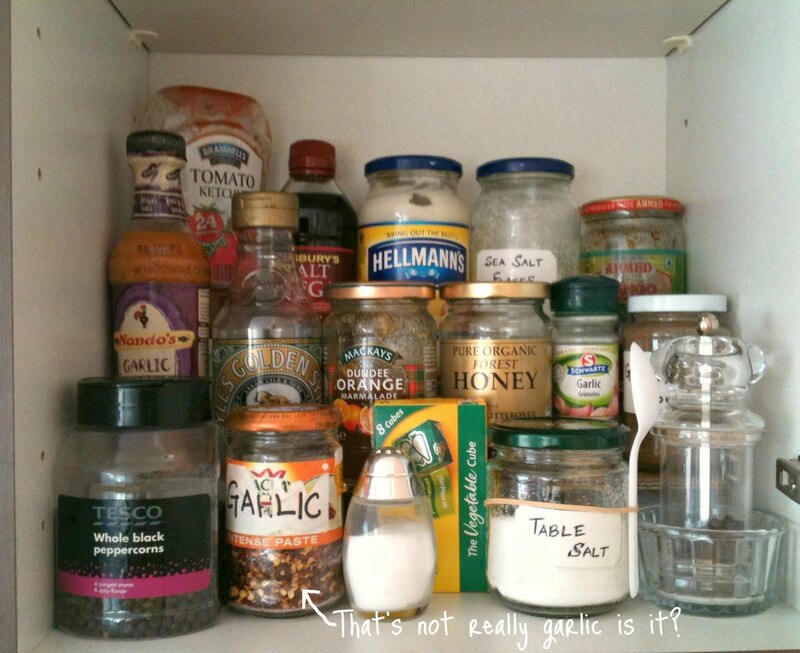 That's kitchen cupboard perfection for me. Now all I need to do is change the label on my chilli flakes jar. Boo. Another time. Go on and give this a go ... let me know how your projects turn out! Toodles!